The Bell 430 is a twin-engined max. 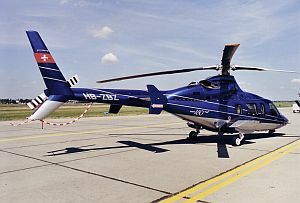 ten-seat light utility helicopter produced by the US-American manufacturer Bell Helicopter Textron, produced in Mirabel, Quebec (Canada). The Bell 430 is a development of the Bell 230 with stretched fuselage, four-bladed main rotor and more powerful engines. The Bell 430 is available either with retractable wheel landing gear or skid landing gear.